The Germany national football team is the national football team in Germany. The team has won the 1954 FIFA World Cup, 1974 FIFA World Cup, 1990 FIFA World Cup and 2014 FIFA World Cup. The team came as second in the 1966 FIFA World Cup, 1982 FIFA World Cup, 1986 FIFA World Cup and in 2002 FIFA World Cup. In the 1934 FIFA World Cup, 1970 FIFA World Cup, 2006 FIFA World Cup and 2010 FIFA World Cup, the team got third place. The teams current coach is Joachim Löw, who took over from Jürgen Klinsmann. From 1950 to 1990, the team was mainly West Germany. Other teams were around that are now part of Germany. These include the East German team (1952-1990) and the Saarland team (1950-1956). Germany has always been one of the best teams in the world. Germany is the only team to have won men's and women's world cup titles. Also, Germany's main rivals are England, the Netherlands and Argentina. The teams recent performance in a tournament was a victory over Argentina to win the 2014 FIFA World Cup. In the semi-final against Brazil, Germany thrashed them with a 7–1 win, making it the largest win in FIFA World Cup semi-final history. Miroslav Klose, one of the greatest German players of all time, also scored a record breaking goal that made him the top scorer in FIFA World Cup history. After another World Cup exit in 1998, Germany's status as one of the best teams in the world was beginning to go away. In the UEFA Euro 2000, Germany failed to advance to the next round, after losing two matches and one draw in the group stage. The manager at the time then resigned and was replaced by Rudi Völler. Going into the 2002 FIFA World Cup, the expectations for Germany was low because of the mediocre performance in the qualifiers. However, they performed very well in the World Cup, eventually making it to the finals but losing to Brazil 0–2. Miroslav Klose of Germany won the Silver Boot and Oliver Kahn won the Golden Ball. Germany again failed to advance to the next round in the UEFA Euro 2004 after they tied two matches and lost one. The manager Rudi Völler resigned shortly afterwards. Jürgen Klinsmann then replaced him, although having no experience. Joachim Löw was also assigned to assist him. Klinsmann made Michael Ballack captain after the Euro 2004. Klinsmann main goal was to help Germany perform well in the next world cup. 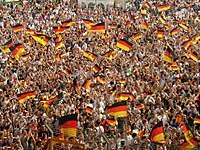 German fans watching their team in the 2006 FIFA World Cup. Before the tournament, not many people expected Germany to do well because of their performance in the last tournaments. However, Germany won the first match of the tournament against Costa Rica. They continued to build confidence, and they eventually advanced to next stage with three wins in the group stage. Germany then beat Sweden 2–0 in the Round of 16. Germany then faced favourites Argentina in the quarter-finals. Argentina took the lead first in the match with a goal by Roberto Ayala in the 49th minute. Miroslav Klose then equalized with a goal at the 80th minute. The game later went to a penalty shootout, with Germany winning 4–2 and their goalkeeper Jens Lehmann making two saves. Although many then expected Germany to reach the final, they lost in the Semi-finals to Italy after Italy scored two goals in extra time. However, the German team went on to thrash Portugal 3–1 in the third place match. After the World Cup, Miroslav Klose won the Golden Boot and Lukas Podolski won the Best Young Player award.Also, four of Germany's players were put in the All-Star squad. When the German team arrived back in Berlin, they were greeted by 500,000 fans who were all honoring the German team. Klinsmann left the German team after the World Cup, with Joachim Löw taking the throne. Löw was known for often putting young players in the team. The German team then easily qualified for the UEFA Euro 2008. In the final tournament, Germany advanced to the next round after they finished the group stage with two wins and one loss to Croatia. Germany then played Portugal in the quarter-finals and beat them 3–2 with goals from Bastian Schweinsteiger, Miroslav Klose and Michael Ballack. They then went to the Semi-finals against Turkey and barely defeated them 3–2 after Philipp Lahm scored on the 90th minute. In the final of the Euro 2008, Spain were the favourites but Germany was believed to have a chance. Spain took control of the game and with Fernando Torres's goal, Spain won the tournament. Germany easily qualified in their qualifying group against Azerbaijan, Finland, Liechtenstein, Russia and Wales. In the tournament, Germany advanced through the group stage after winning two games and loosing one against Serbia. Germany then went on to dominate the Round of 16 and Quarter-finals after defeating England 4–1 and thrashing Argentina 4–0. In the semi-finals, Germany lost to Spain 1–0. Germany then beat Uruguay 3–2 to become the third place medal winners. Thomas Müller won the Golden Boot and the Best Young Player award. Germany also scored the most than any other team in the tournament, with 16 goals. German national football team training in Gdańsk. German national football team during Euro 2012 qualifiers. Germany won all ten of their qualifying matches for the UEFA Euro 2012. They later were placed in Group B along with Portugal, the Netherlands and Denmark. The team went on to win all their matches in the group stage and broke a record of 15 consecutive wins in all matches. They then beat Greece 4–2 in the quarter-finals with goals from Philipp Lahm, Sami Khedira, Miroslav Klose and Marco Reus. However, they lost to Italy 1–2 in the semi-finals. Germany almost had ten straight wins in the qualifying round for the 2014 FIFA World Cup. However, in a game against Sweden, the team conceded 4 goals when they were up 4–0 up. The team performed well in the international friendlies before the World Cup with an unbeaten streak. Their most notable win was against Armenia, where they won 6–1. Germany was put in Group G with Portugal, Ghana and the United States. Philipp Lahm with Germany after the 2014 FIFA World Cup final. The first match against Portugal ended with Germany defeating them 4–0; with the help of Thomas Müller's hat-trick. Their second game against Ghana ended with a 2–2 draw after Miroslav Klose equalized the score. Their final game ended with a win against the United States after Thomas Müller scored at the 55th minute. In the quarter-finals, Mats Hummels scored the winning goal at the 13th minute, meaning that Germany advanced to their fourth consecutive semi-final in the FIFA World Cup. In the semi-final against Brazil, Germany thrashed them with a 7–1 win, making it the largest win in FIFA World Cup semi-final history. Miroslav Klose also scored a record breaking goal that made him the top scorer in FIFA World Cup history. The win began to be known as the Miracle of Belo Horizonte. Germany then went on to their 8th World Cup final in history. In the final, Mario Götze scored at the 113th minute to help Germany defeat Argentina 1–0. Some German players warming up before a qualifying match with Gibraltar. Germany was put in a qualifying group with Poland, Republic of Ireland, Scotland, Georgia and Gibraltar. They qualified at the top of their group after 7 wins, 1 draw and 2 losses. They are currently placed with Ukraine, Poland and Northern Ireland in the group stage. Franz Beckenbauer, was a very popular coach who lead Germany to the 1990 World Cup victory. Miroslav Klose (top) is Germany's all-time top scorer with 71 goals, and Gerd Müller (bottom) is Germany's second all-time top scorer with 68 goals. The bronze medal won by Germany in 1934. Joachim Löw and his assistant, Hans-Dieter Flick. The Imtech Arena in Hamburg. The Mercedes-Benz Arena in Stuttgart. Germany doesn't have an official stadium, so they use many stadiums. The city of Berlin has been the host of the most German games (44 times). The Olympiastadion Berlin is the most commonly used stadium in Berlin, and it holds 74,500 seats. Other common cities to host games have been Hamburg (33 matches), Stuttgart (31), Hanover (26) and Dortmund. Another popular location is Munich, which hosted the 1974 FIFA World Cup Final, where Germany defeated the Netherlands. German fans during the 2006 FIFA World Cup. ↑ "The "Mannschaft" :: National Teams :: DFB – Deutscher Fußball-Bund e.V." www.dfb.de. Retrieved 12 June 2018. ↑ "DFB unveil new "Die Mannschaft" branding". DFB. Retrieved 8 June 2015. ↑ 4.0 4.1 "Germany: FIFA/Coca-Cola World Ranking". FIFA. Retrieved 12 September 2013. ↑ "All matches of The National Team in 1908". DFB. Archived from the original on 23 October 2012. Retrieved 1 August 2008. ↑ "All matches of The National Team in 1909". DFB. Archived from the original on 10 June 2009. Retrieved 1 August 2008. ↑ FIFA.com. "2014 FIFA World Cup Brazil™ - Matches - France-Germany". FIFA.com. ↑ Malone, Emmet. "No redemption as Brazil humiliated by Germany". The Irish Times. ↑ "Löw streicht Bellarabi, Brandt, Reus und Rudy". DFB. Retrieved 31 May 2016. ↑ "World Cup 2014: Which players are going to Brazil?". 7 June 2014 – via www.bbc.com. ↑ "Fussballdaten - Die Fußballdatenbank der Bundesliga". Fussballdaten. ↑ In Germany, the team is typically referred to as Die Nationalmannschaft (the national team), DFB-Elf (DFB eleven), DFB-Auswahl (DFB selection) or Nationalelf (national eleven). Whereas in foreign media, they are regularly described as Die Mannschaft (The Team). As of June 2015, this was acknowledged by the DFB as official branding of the team. This page was last changed on 18 March 2019, at 17:19.